The Standing Rock Sioux Have Been Heard. Now What? Thousands of people, including members of some 280 tribal nations, have gathered at the Sacred Stone Camp near Cannon Ball to protest the pipeline, in what has been called the largest Native American gathering since the Battle of the Greasy Grass—or Little Bighorn. People kept arriving over the weekend, even after the government handed over an apparent victory. The agencies’ announcement signals that the protesters have been heard—no small thing, considering that earlier in the week, while traveling in Laos, President Obama responded to a question about the pipeline as if he’d hadn’t heard about it. But it was no outright victory. The decision halts construction on a fraction of the pipeline’s route, namely the section immediately bordering and under Lake Oahe. The government also requested a “voluntary pause” to construction within a 20-mile radius, but it’s not clear yet if the pipeline company will comply. Federal agencies have limited authority throughout the remainder of the 1,172-mile construction route, because 99 percent of it crosses private land. “At this point, I don’t think we really know what’s going to happen next. 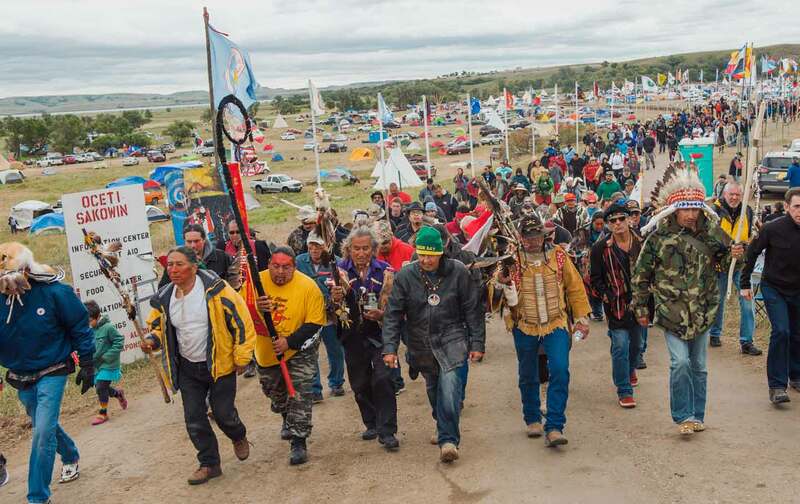 We don’t have any details from the government about this reconsideration process,” said Jan Hasselman, an attorney with Earthjustice who is representing the Standing Rock Sioux. “We’re taking them at their word that this will be a meaningful process.” Given the uncertainty, some people camped at Standing Rock are making plans to stay through the winter, even into next year. "What we have been doing is to look out for the future, not just for indigenous children but for all nations." More than a dozen people were arrested at protests over the weekend in Iowa, where the state’s utility board has granted eminent-domain rights to the Texas company backing the pipeline, affecting hundreds of landowners. Fifteen of them are engaged in an ongoing legal suit alleging that the utility board’s decision violates a state law passed in 2006 to protect property from being seized for private development. “The fact that they classified a privately owned pipeline as a public utility is pretty remarkable to those of us who were part of that fight back in 2006,” said Ed Fallon, who worked on the bill as a state legislator and now directs the activist group Bold Iowa. While the lawsuit proceeds, Fallon hopes the Corps of Engineers will reassess the implications of the permits they’ve granted for Iowa’s farming industry. “The southern reaches of the Missouri watershed and the Mississippi watershed are the lifeblood for our farmers, and we need the federal government to take our situation in Iowa as seriously as it’s now taking the consequences that the tribal community is facing in North Dakota,” Fallon said. Going forward, there are outstanding questions about the action taken by Dakota Access and North Dakota State officials towards activists, journalists, and sacred sites. In early September, Democracy Now! published video footage of dogs being pushed towards protesters by a employees of a private security contractor. One dog was shown with blood on its muzzle; a pregnant woman and a young child were among those reportedly bitten. (Some protesters appear to have thrown rocks in response.) Morton County officials issued a warrant for the arrest of Amy Goodman, the Democracy Now! reporter responsible for exposing the canine attacks. Another protester, Cody Charles Hall, was arrested for trespassing and denied bail—an unusually punitive move for misdemeanor charges. There is no indication that the use of force by security personnel is being investigated. (The office of the state attorney for Morton County did not respond to an inquiry.) The conflict sparked after construction crews tore through two areas that the tribe had identified in court filings as sacred sites just a day earlier. There are two other critical questions pertinent to the government’s review. The first is how the decision to route the pipeline near the Standing Rock reservation was made. Initially, the route crossed the Missouri further north, near Bismarck, but it was redrawn out of concern for the capital city’s water supply. Hasselman said that the decision to relocate the crossing just upstream of Standing Rock was “a classic example of a long and dishonorable history of putting the impacts of pollution on people who are most politically and economically disadvantaged.” The second question has to do with the integrity of the environmental assessment that the Corps of Engineers relied on, which was conducted by Dakota Access itself. When the Corps gave final approval for the pipeline, it did so despite objections raised by the Environmental Protection Agency, the Department of the Interior, and the Advisory Council on Historic Preservation over problems with that assessment. The federal government’s intervention on Friday was a tacit confirmation that the Corps’s approval process for Dakota Access was inadequate. Such an acknowledgement likely would not have come if thousands hadn’t gathered at the Sacred Stone Camp–another case in which activism brought more immediate relief than the legal system did. The most obvious parallel is the Keystone XL pipeline, which Native Americans played a role in halting. But what’s happening in North Dakota reflects a growing tribal-sovereignty movement that, while often intersecting with climate activism, has its own particular history and aims. Many people who traveled to Sacred Stone have their own battles back home, and many are winning: In British Columbia, the Unis’tot’en have built a “resistance camp” to block seven proposed pipelines; the Lummi in Washington State asserted their treaty rights to kill plans for what would have been the largest coal port ever built in North America last year; and just this month, Enbridge announced it would “no longer pursue” a proposed pipeline in Minnesota, after opposition from tribal governments.